Today, McGraw Hill released the new book by Louis Carter CEO of Best Practice Institute, top Executive Coach, and Top 10 Organizational Culture Guru by Global Gurus, entitled, In Great Company: How to Spark Peak Performance By Creating an Emotionally Connected Workplace. McGraw Hill released the new book by CEO of Best Practice Institute, top Executive Coach, and Top 10 Global Guru, Louis Carter entitled, "In Great Company: How to Spark Peak Performance By Creating an Emotionally Connected Workplace." The book presents a researched and evidenced based strategy to boost the effectiveness of your teams and propel the growth of your business. The most valuable asset for any business is its people. But for all the talk of employee engagement, too many approaches leave employees uninspired. What really catalyzes people is truly loving where they work, and feeling a bond with their company. More than fancy software or flashy salaries, what drives engagement and performance is an emotional connection. When people see how their work affects organizational outcomes positively, and see that their work matters to their managers, colleagues, and the wider world, that's emotional connectedness. It is a motivating sense of satisfaction and intellectual alignment -- and it can only come from feeling appreciated, respected and part of a shared and worthy purpose. 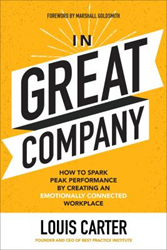 In Great Company: How to Spark Peak Performance By Creating an Emotionally Connected Workplace (McGraw-Hill Education, February 21, 2019), is written by organizational leadership expert Louis Carter shows leaders how to forge that connection. He lays out a highly effective prescription for getting your people to love where they work, and fill the employee experience with a sense of belonging and meaning. His formula for building a great company is based on his years of experience advising CEOs and executives, his own tenure as CEO, and a long research journey. To learn more about how companies such as Best Buy, Netflix, and countless other firms lead the market, Carter spoke to and interviewed hundreds of executives, CEOs and CHROs, as well as hundreds of other employees. At conferences, while consulting, and via executive round tables and surveys, he found that emotional connection is at the heart of a thriving organization -- and far more powerful a driver of performance than engagement. Why emotional connection is directly linked to long-term company growth and profits. Bridging the engagement gap can't be done piecemeal. Carter's holistic strategy covers every facet of the workplace, and works in any organization from legacy to startup, multinational to small and lean. It provides CEOs with a comprehensive game plan and real-life, practical examples for unleashing the power of people. When leaders can bring staff and company together, the result is an unprecedented level of performance, and a truly great company.